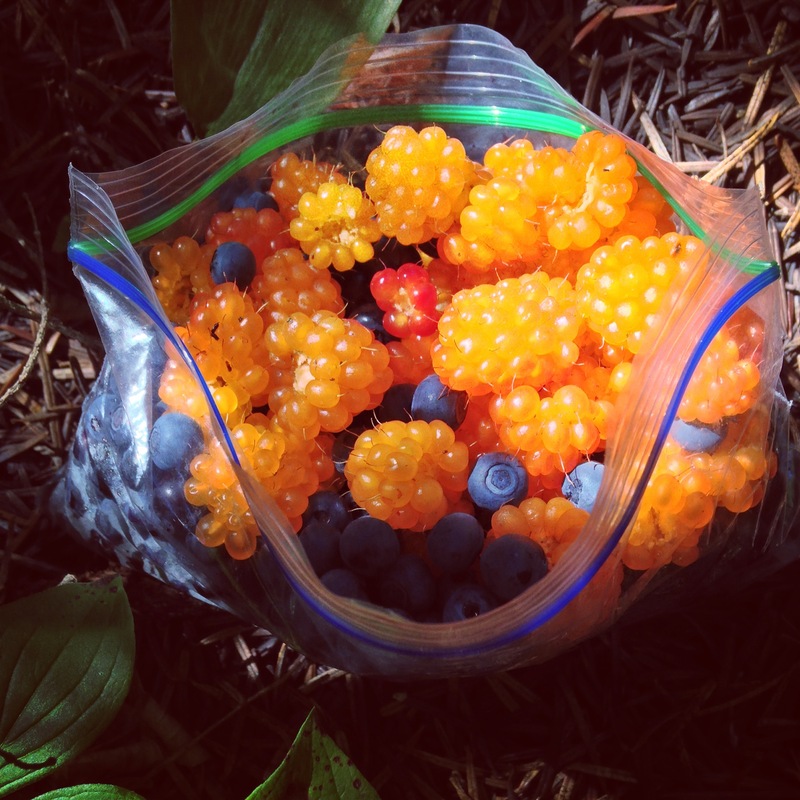 What food do we take backpacking and what should you take? Recipes are below and more suggestions below that! – What’s the best Camp Coffee?? 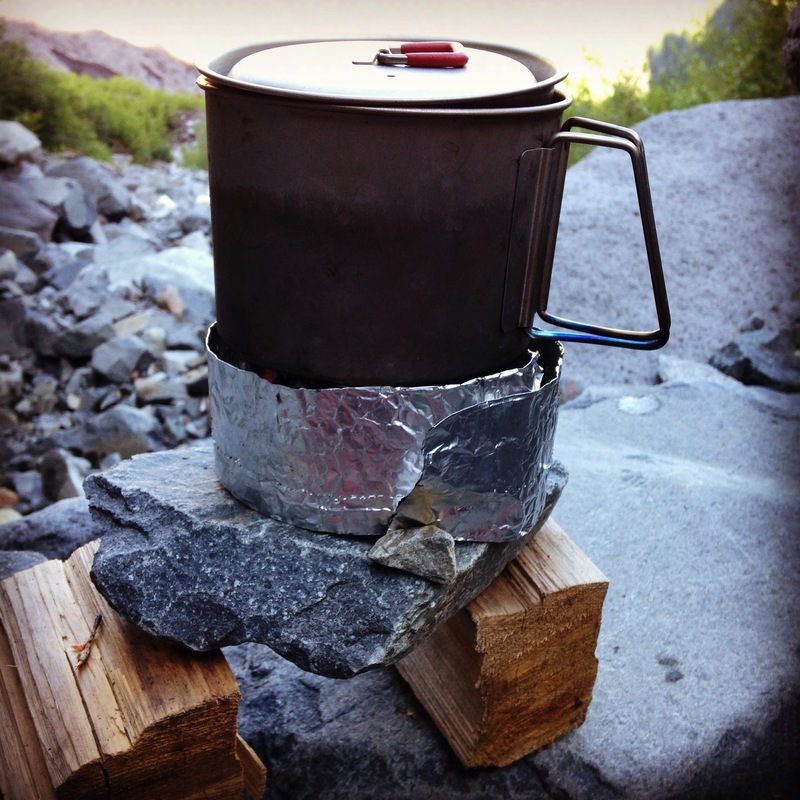 Really, really short on time to prep food for your backpacking trip? Make it extra easy: Grab a box of oatmeal packets (you can rehydrate right in the package if you need to!) and instant coffee – that’s breakfast. A bunch of granola and energy bars and trail mix, a snickers or potato chips, an apple, optional tortillas with peanut butter or cheese and salami – that’s lunch. Knorr Pasta or Rice sides, Idahoan instant mashed potatoes, ramen, or Mac&Cheese plus a packet of tuna or jerky or both – that’s dinner. Marc: We need to get food stuff in order for our backpacking trip (a little late I know haha). But we were wondering what advice you seasoned backpackers had and if you know of or had some good stores or something nearby. Thanks a ton! Me: No problem! Go to QFC if short on time or QFC + REI + Coop + Uwajimaya if time. Variety is good. The backpackers pantry etc foods at REI are really easy. We usually eat ramen, Idahoan mashed potatoes, and Annie’s Deluxe Mac&cheese (cheese as goop not powder). Or we’ll make our own dinners with instant rice or pasta. You can find dehydrated black beans, refried beans, and soups in bulk at the coop or other places that sell in bulk bins. Uwajimaya (the Asian food market) has dried beef and pork in containers. It’s hard to find dried veg w/o ordering online but there are some options at REI. Tortillas are always good. And tuna packets. You can find packets of chicken. Spam if you’re adventurous. Usually bars (pro, epic, etc) and cheese, crackers, salami, jerky, and/or chips for lunch. Breakfast: usually oatmeal packets with extra dried fruit, nuts, and shredded coconut or grits with cheese or cheese powder, spices, and/or veg. Or granola with dried coconut milk. Don’t forget the hot chocolate, instant coffee, tea, electrolytes, and/or emergenC. The food you take depends on several factors. 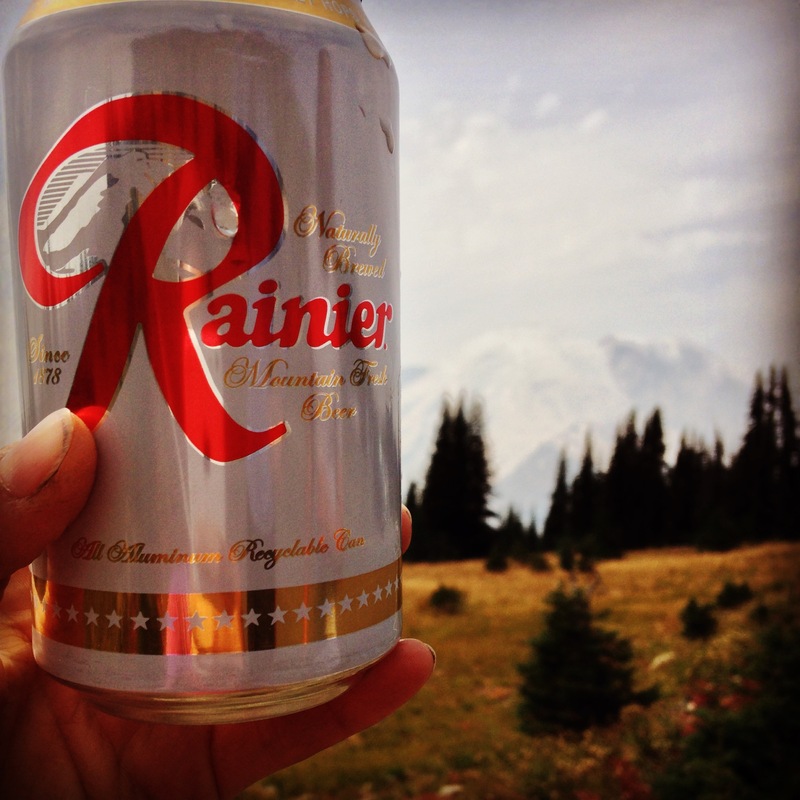 How long are you going out there – Day hike? 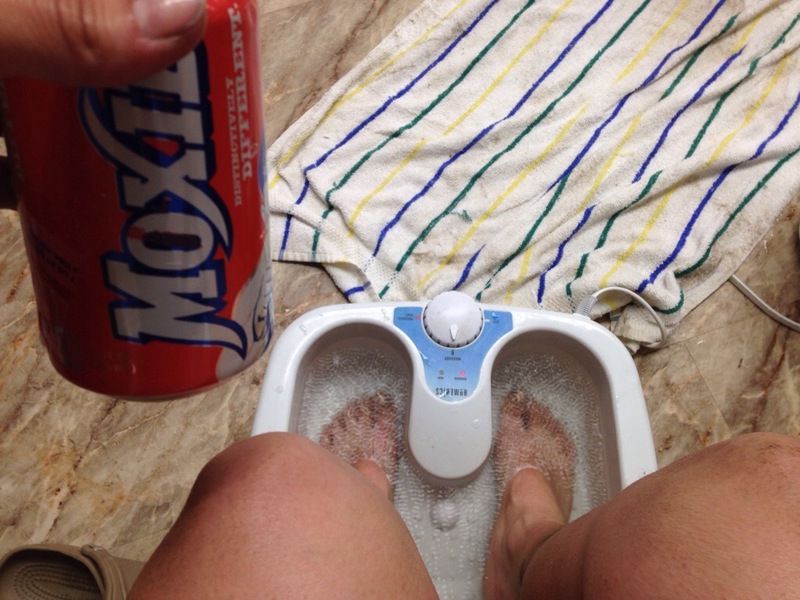 Multiday hike? Thru-hike? Day hike food is usually bars and chips or leftover chicken salad on pita, or something fresh. 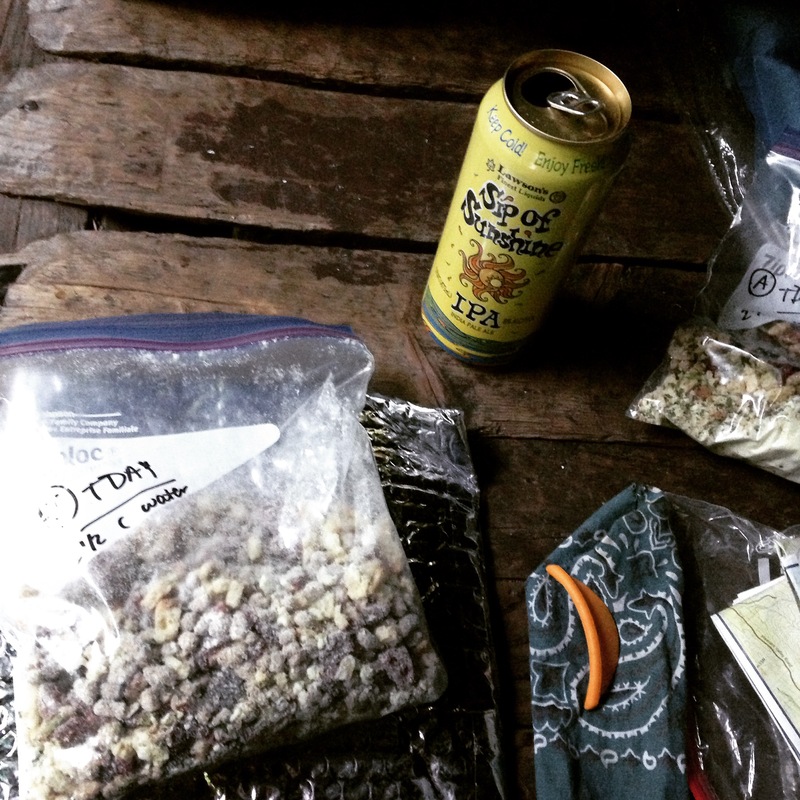 A thru-hike usually involves totally dry food. But maybe a luxury veggie or two for the start of each section. 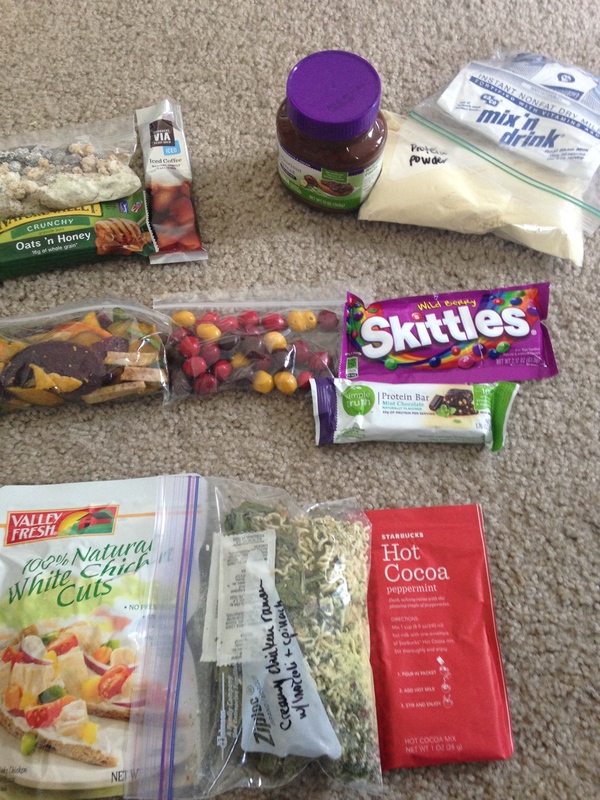 Assembling food in advance for a thru-hike is a lot of work. But it can be worth it. Or not. It’s probably worth at least researching the food options for each town stop and deciding if you can resupply as-you-go or if you need to send some food ahead. If assembling food, combine what you can, toss extra packaging, and repackage in ziplock freezer bags – especially if you plan to rehydrate in the bag. On the Wonderland Trail I carried a jar of faux nutella and it was amazing. Peanut m&m’s are wonderful. Nature valley granola bars or plain white tortillas and Justin’s nut butter are so good. Whole wheat or any “healthy” tortilla tastes absolutely terrible on the trail – go with plain white flour. 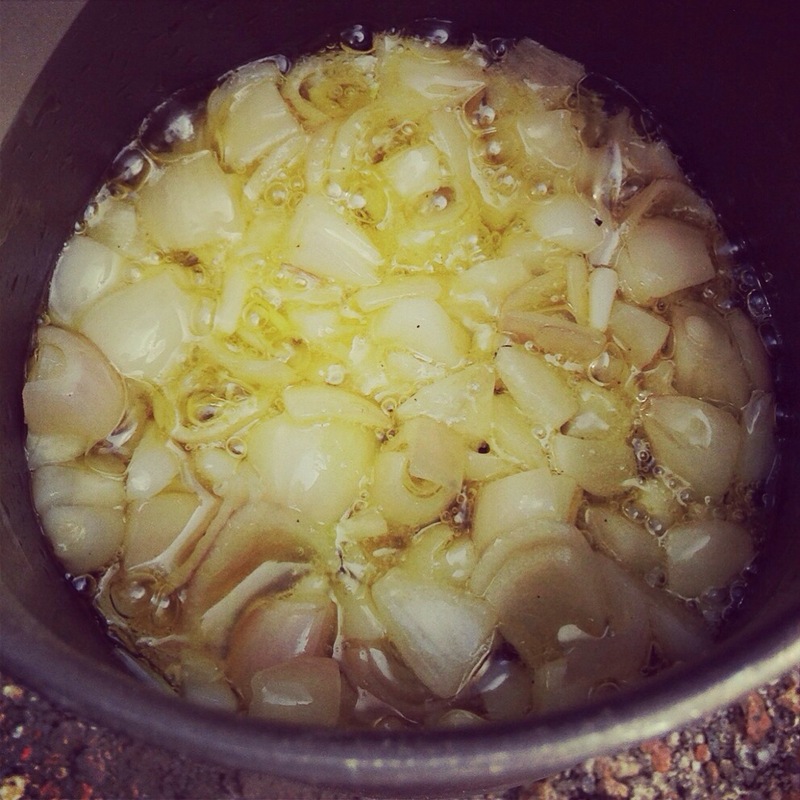 Healthy mashed potatoes are too bland – Idahoans, while too much in real life, are great on the trail. The trifecta (Idahoans, Ramen, Annies mac&cheese) is a glorious thing. Calorie counting can be helpful but it can get complicated. My advice is eat when you’re hungry, stop when you’re full. The hiker hunger kicks in after a few hundred miles, and after that your appetite will really pick up. Jared likes his diet to be a balance of low glycemic (for sustained energy) and high glycemic (for instant energy) foods. He’s a huge fan of adding dried mushrooms from the local asian food superstore to ramen. Huge blocks of cheese are the way to go. Tuna packets (or flavored tuna packets!) on crackers is way more satisfying than an energy bar. Sailor Boy pilot bread is actually amazing. On the Long Trail I discovered baby food. With mixed results – baby food is a good way to get nutrients but the texture is just too weird for me. However, the best application was pumpkin-squash babyfood on a beans, rice, veggie, and cheese burrito. Maple syrup is amazing and Untapped makes packets – expensive but really wonderful. Hot chocolate while dinner is cooking is wonderous. Nido is a full fat dry milk – great on long thru-hikes – but doesn’t taste as good as the lowfat stuff. Coconut milk powder wins the best dried milk award. Cabot extra sharp cheddar on stoned wheat thins tastes really really good. Snyders of hanover hot buffalo wing pretzel pieces are great in moderation and I’m pretty sure affect my hiking performance. A few food thoughts which I gleaned from the AZT include: granola with coconut milk powder for breakfast is really good. Tasters choice instant coffee is cheap and not bad. Mornings where I ate oatmeal I felt fueled for the day. 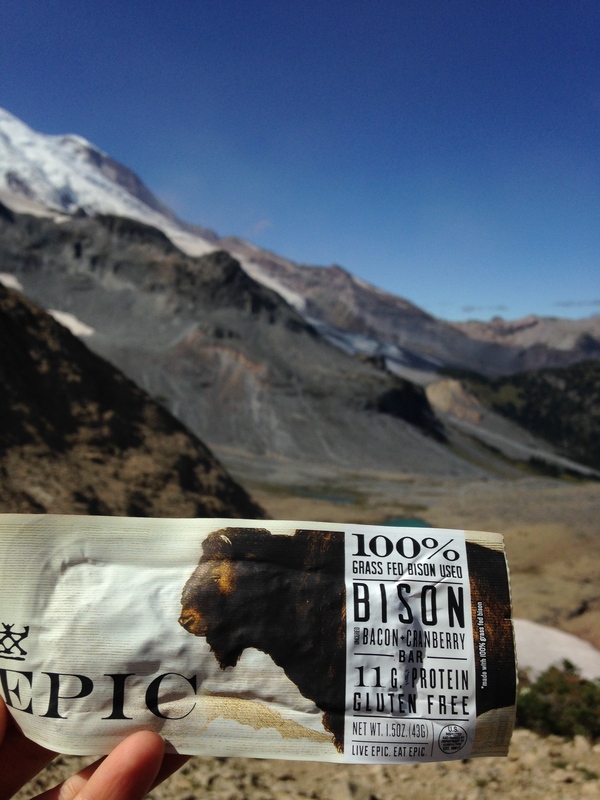 Start the trail with a 2-3 bars or GORP servings per day, and increase to 4-6 per day as the hiker hunger hits. More GORP would be a good way to mix up the granola bars. A lunch of tortillas with cheese and hot sauce or salmon and olives was perfect. A dinner of ramen with tuna and seaweed seemed to hit the spot often. Knorr rice sides aren’t bad. Pack more Snickers. And pack more hot chocolate. Trail mocha is the best way to start the day (2 packets coffee, 1/2 packet hot chocolate, coconut milk powder). A few more thoughts – car camping necessitates s’mores, cans of baked beans, veggies cooked in tin foil, and bacon and eggs for breakfast. And pancakes and sausages. Don’t forget the boxed wine sans box – just the bag. Or the whiskey. 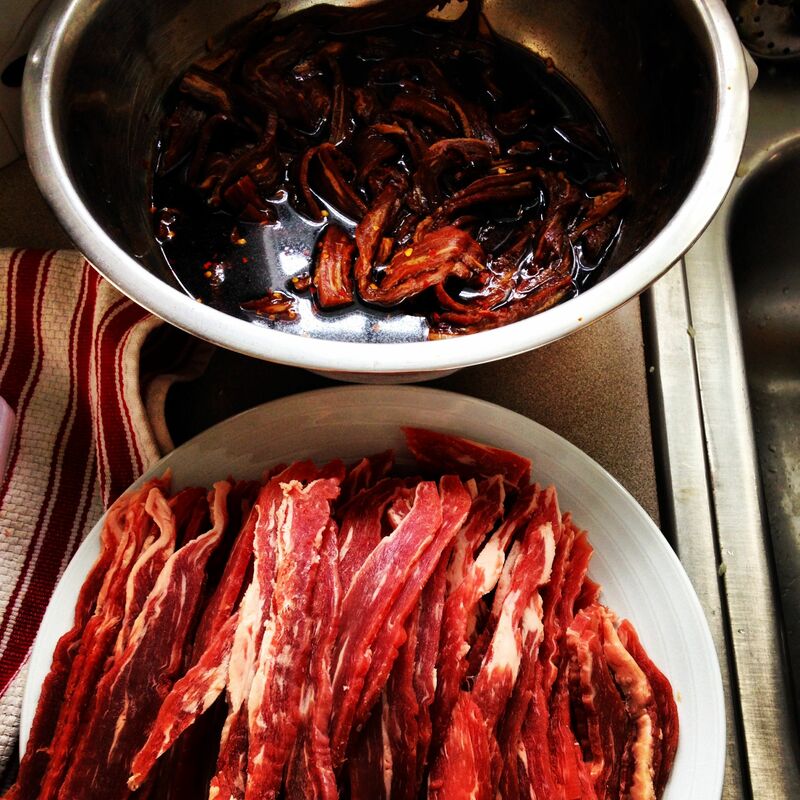 Making jerky is good…but much faster to buy! Thanksgiving-on-the-trail and Lawson’s Sip of Sunshine! 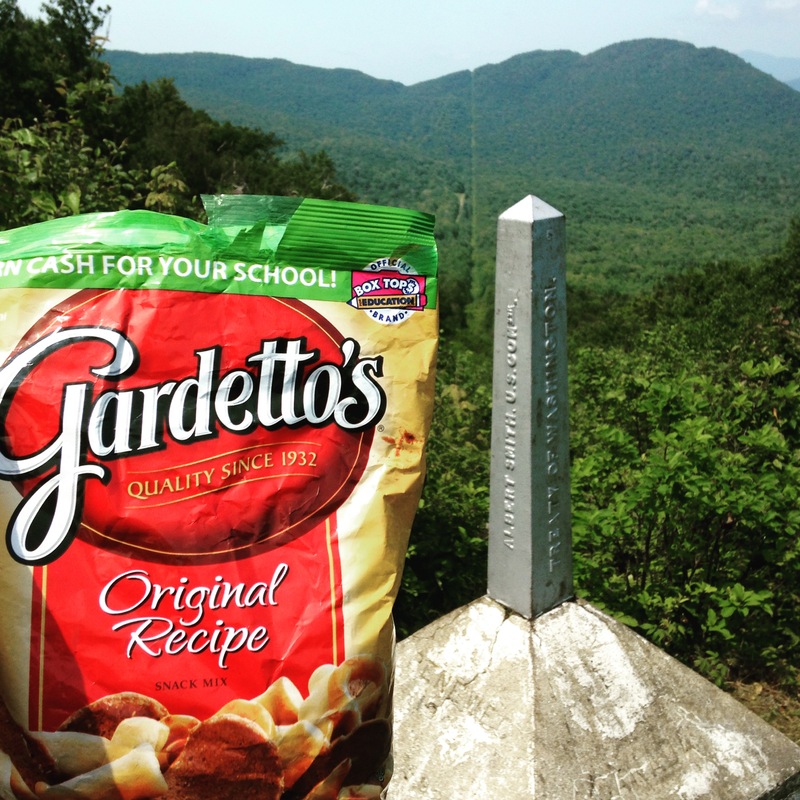 Thanks for the Gardetto’s, Jared!